THE southwest slopes of New South Wales is set to gets its first solar farm with approval being granted this month for a 248-hectare development 17 kilometres south of Temora. Known as the Sebastopol Solar Farm, it is being built by German engineering company ib vogt GmbH as its first development in NSW. It is located within the Temora Shire Council area, and borders the Junee Shire. The land is currently used for grazing and cropping, and is being leased from a farming family. Sebastopol Solar Farm will include solar arrays, energy storage and a substation, and will connect to the existing transmission line which runs west of the site. 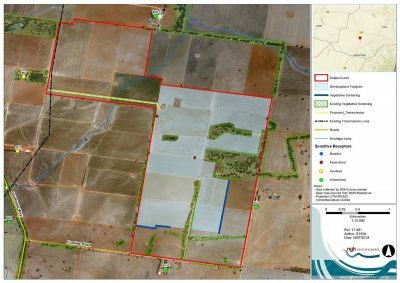 The solar farm layout avoids most environmental constraints and has been designed to minimise the removal of remnant native vegetation, and its footprint has been revised from the initial design to reduce potential visual impacts. The capacity of the solar farm proposal has been reduced to 108 megawatts (MW), which is expected to generate enough electricity to power approximately 40,000 households, based on the assumption of average household consumption of 5920 kilowatt hours per annum. Ib vogt operates in Europe, Africa, India and Southeast Asia, and has built energy projects which are jointly generating more than 900 MW per annum. Ib vogt has been active in large-scale solar developments in Australia since 2016, and its first project was the Williamsdale Solar Farm, an 11MW energy plant near Canberra.